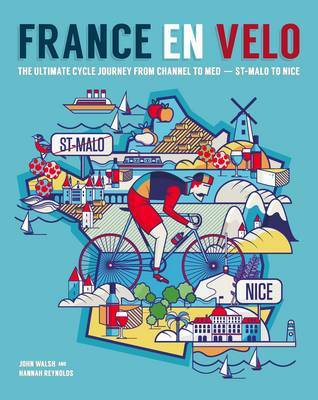 n this beautifully illustrated guide to travelling across France by bike you will discover hidden lanes, stunning gorges, amazing places to eat and stay, plus the best of French cycling culture. This iconic journey of more than 1000 miles takes you through no fewer than 21 of France's regional departements and into some of the country's most striking and dramatic landscapes helping you to discover the true heart of rural France. Ride one section, follow a mini itinerary, or complete the entire challenge! Starting in St.Malo on the coast of Brittany the route winds its way through quiet lanes on the banks of rivers, through dramatic gorges and quintessentially French villages before reaching the dazzling glamour of Nice on the French Riviera. Beautifully illustrated maps, detailed directions and PDF downloads guide you along the route providing essential information and revealing the many hidden secrets of the area.